Absolute Bowie are EuropeÃƒ¢Ã¢â€š¬Ã¢â€ž¢s Finest David Bowie Tribute. Waterside Arts Centre, 1 Waterside, Sale, M33 7ZF. Absolute Bowie are Europeâ€™s Finest David Bowie Tribute. The five piece has toured all over Europe for the last 8 years, faithfully performing the music of David Bowie with uncanny accuracy. 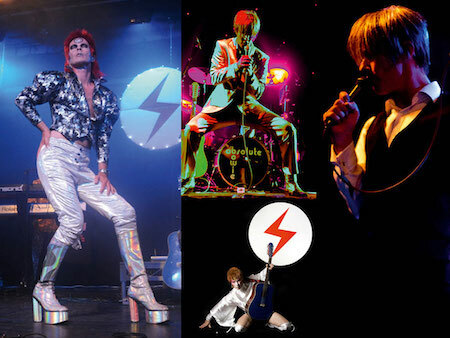 The audience are taken on a journey experiencing the different personas of Bowie, from Ziggy Stardust and Aladdin Sane through to The Thin White Duke and the late 80's. "Absolutely wicked. As one who was there, watching AB put me back there again. For anyone who missed it or fans who want to relive it I definitely recommend it. As close to the real thing that you'll get. Enjoy." - Woody Woodmansey (Spiders from Mars).